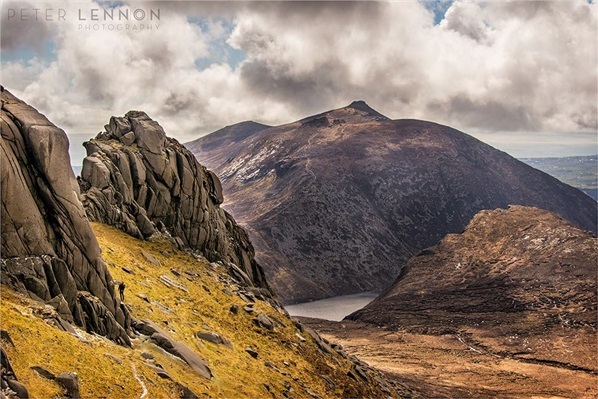 Mourne Mountains – What’s in a Name? 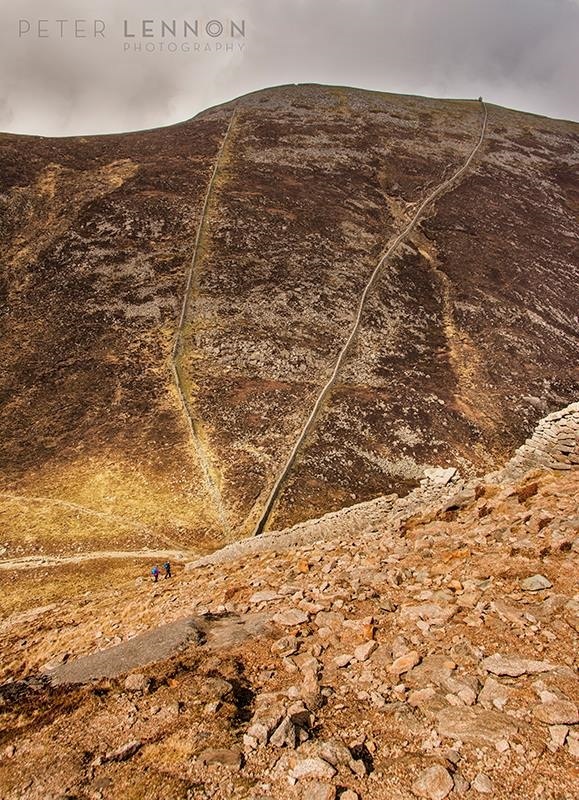 Every wondered what the names of the Mourne Mountains actually mean? 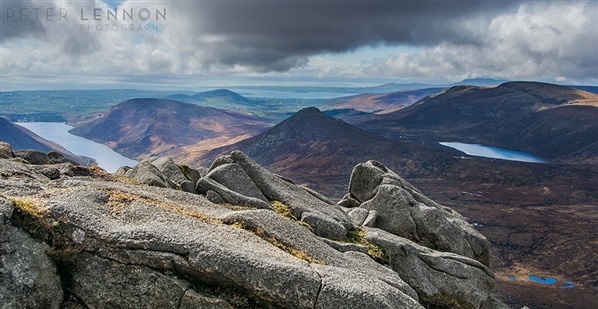 With the help of some fantastic shots from Peter Lennon Photography we have put together a collection of summits (or Slieves from the Irish word ‘Sliabh’ meaning mountain) and the meanings behind their names. Slieve Meelmore (682m) meaning mountain of the large (Mor) animals. With two impressive rocky tors and a col lying between them it is easy to see where Slieve Bearnagh (739m) from the Irish “Sliabh Bearna” meaning “Gapped Mountain” gets its name. Looking across at Bearnagh on the right with Ben Crom Reservoir hidden below walkers in the distance. The name Lamagan (704m) means “by hands and feet! !”giving a hint at how steep this summit is. View from Slieve Lamagan - taken from the summit looking across a Slieve Binnian (left) and Ben Crom reservoir below with the tip of the Silent Valley reservoir just coming into view. 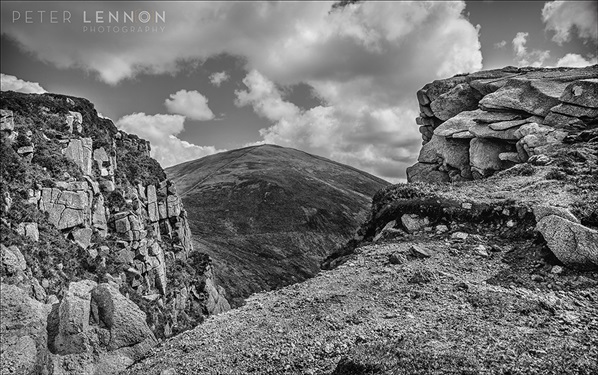 Slieve Donard (850m) is named after Saint Donard, known in Irish as Domhanghairt or Domhanghart. A follower of Saint Patrickand he founded a monastery at Maghera, north of Newcastle. According to tradition he was appointed by Saint Patrick to guard the surrounding countryside from the summit. 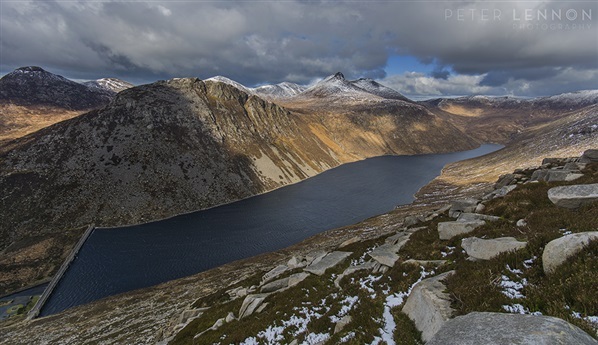 View more of Peter Lennon's fantastic photography of hte Mournes and other landscapes on his Facebook or Twitter pages. 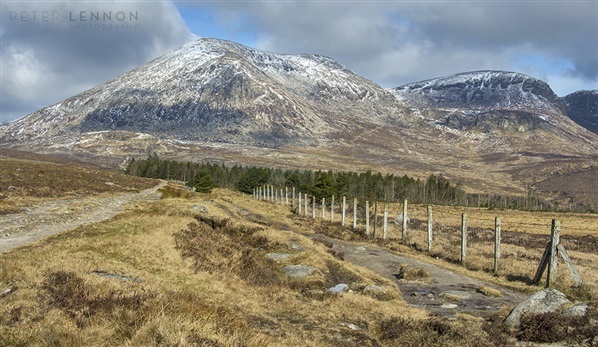 Visit WalkNI for more information on walking in the Mourne Mountains. If you’re looking to do something different this year for your kids birthday party but are lacking in ideas, take inspiration from our selection of kids unique birthday party ideas on offer to little adventure seekers across Northern Ireland. For those kids who want the ultimate adrenaline fix this is a party sure to get everyone talking! With specially adapted Land Rover's meaning the kids aged 4+ years old can drive (yes you read that right!) their day will start behind the wheel negotiating the obstacles with an instructor. The day will finish up by seeing who can stay on two feet during a body zorbing session. The ultimate beach party! Enjoy a private surf lesson before a BBQ and use of the beach hangout zone which includes a beach volleyball court, small marquee and slack line!! Available for children aged 6 and up (including adults) so you too can celebrate. A great day out for your little adventure seekers as they have a go at a range of activities including low ropes, orienteering and 2 person trikes during a 2 hours of activities with fully qualified instructors. The day wraps up in the party room where you can enjoy some yummy party food, cake and party games before heading home. Plan a party filled with action, adrenaline and adventure! The choice of what activities to take part in is yours and you'll be provided with a free birthday cake, decorated birthday table and carrowmena merchandise for the birthday boy/girl. Suitable for kids aged 6-16 years old depending on activities. The perfect solution to planning an epic birthday party for your teenager (12-17 year olds). With sessions in kayaking, climbing, archery and bouldering this is one action packed day out they won't forget about in a hurry. An adventure playground for kids aged 5-15 years old, make their party one they'll not forget in a hurry. Begin the party with some warm up activities before adding some bigger adventures incluiding body zorbs, paintballing, climbing walls and adventure hunts depending on how much time you have. Tell us about your kids unique birthday party adventures on Facebook & Twitter. With the school summer holidays just around the corner, lots of adventure awaits! Whether you're a stay at home parent or needing to head off to work each morning, here are some alternative summer schemes across Northern Ireland to to help you out and keep the kids entertained. An action packed week of learning new skills, making new friends and enjoying lots of new adventures. Activities will include canoeing, mountain biking, river tubing and more. Suitable for kids aged 5-15 years old. Make a splash this summer by dropping the kids off at the beach for 5 days of making new friends, learning to surf and playing lots of beach games all under the watchful eye of Long Lines fully qualified instructors and lifeguards. Choose between one day or a week full of adventurous activities including high ropes, kayaking, climbing, hillwalking and more. Suitable for kids aged 8-15 years old. There is also an option to spend Thursday night camping underneath the stars. Avoid the kids sitting square eyed in front of the TV this summer by signing them up to 5 days of exciting new adventures including caving, bush craft, mountain biking and more. Suitable for kids aged 8-12 years old. Set in the grounds of the stunning Castle Ward Estate this is one summer scheme the kids won't forget about in a hurry. With activities including pier jumping, canoeing, mountain biking and more they'll be ready for a good night's sleep. Suitable for kids aged 8-15 years old. Just a stone's throw from the city centre leave the kids off on your way into work for a week of action packed adventures. Activities will include water zorbing, canoeing/kayaking, archery and more. Suitable for children aged 8-16 years old. With more and more clubs and associations hosting summer schemes for kids keep an eye on OutdoorNI.com to stayed clued in!